BEIRUT - From the moment Saad Hariri’s plane touched down in Saudi Arabia on Friday Nov. 3, he was in for a surprise. There was no line-up of Saudi princes or ministry officials, as would typically greet a prime minister on an official visit to meet with King Salman bin Abdul-Aziz al-Saud, senior sources close to Hariri and top Lebanese political and security officials said. His cellphone was confiscated, and the next day he was forced to resign as prime minister in a statement broadcast by a Saudi-owned TV channel. The move thrust Lebanon back to the forefront of a struggle that is reshaping the Middle East, between the conservative Sunni monarchy of Saudi Arabia and Shiite revolutionary Iran. Their rivalry has fueled conflicts in Iraq, Syria and Yemen, where they back opposing sides, and now risks destabilizing Lebanon, where Saudi Arabia has long tried to weaken the Iran-backed Hezbollah group, Lebanon’s main political power and part of the ruling coalition. Sources close to Hariri say Saudi Arabia has concluded that the prime minister — a longtime Saudi ally and son of late Prime Minister Rafik al-Hariri, who was assassinated in 2005 — had to go because he was unwilling to confront Hezbollah. 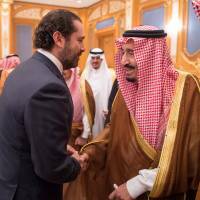 Multiple Lebanese sources say Riyadh hopes to replace Hariri with his older brother, Bahaa, as Lebanon’s top Sunni politician. Bahaa is believed to be in Saudi Arabia and members of the Hariri family have been asked to travel there to pledge allegiance to him, but have refused, the sources say. Saudi Arabia has dismissed suggestions it forced Hariri to resign and says he is a free man. Saudi officials could not immediately be reached for comment on the circumstances of his arrival, whether his phone had been taken, or whether the kingdom is planning to replace him with his brother. In his first TV interview since he announced his surprise resignation last weekend, Saad Hariri said Sunday he will return to his country from Saudi Arabia “within days” to seek a settlement with the militant group Hezbollah, his rivals in his coalition government. Hariri, looking downcast and tired, denied he was being held against his will in the kingdom and said he was compelled to resign to save Lebanon from imminent dangers, which he did not specify. He held back tears at one point and repeated several times that he resigned to create a “positive shock” and draw attention to the danger of siding with Iran, Hezbollah’s main patron, in regional conflicts. “We are in the eye of the storm,” Hariri said. Hariri was summoned to the kingdom to meet Salman in a phone call on the night of Nov. 2. Before departing, he told his officials they would resume their discussions the following Monday. He told his media team he would see them at the weekend in the Red Sea resort of Sharm al-Sheikh, where he was due to meet Egyptian President Abdel Fattah al-Sissi on the sidelines of the World Youth Forum. Hariri went to his Riyadh home. His family made their fortune in Saudi Arabia and have long owned property there. The source close to Hariri said the Lebanese leader received a call from a Saudi protocol official the on Saturday morning, who asked him to attend a meeting with Crown Prince Mohammed bin Salman, who is often known as MBS. “From the moment he arrived they (the Saudis) showed no respect for the man,” another senior Lebanese political source said. Hariri frequently visits Saudi Arabia. On a trip a few days earlier, MBS had arranged for him to see senior intelligence officials and Gulf Affairs Minister Thamer al-Sabhan, the Saudi point man on Lebanon. Hariri came back from that trip to Beirut “pleased and relaxed,” sources in his entourage said. He posted a selfie with al-Sabhan, both of them smiling. He told aides he had heard “encouraging statements” from the crown prince, including a promise to revive a Saudi aid package for the Lebanese Army. Hezbollah has a heavily armed fighting force, in addition to seats in parliament and government. Saudi-backed efforts to weaken the group in Lebanon a decade ago led to Sunni-Shiite clashes and a Hezbollah takeover of Beirut. The source said Hariri told al-Sabhan not to “hold us responsible for something that is beyond my control or that of Lebanon.” But Hariri underestimated the Saudi position on Hezbollah, the source said. Al-Sabhan could not immediately be reached for comment. Sources close to Hariri said the Saudis, while keeping Hariri under house arrest, were trying to orchestrate a change of leadership in Hariri’s Future Movement by installing his elder brother, Bahaa, who was overlooked for the top job when their father was killed. The two have been at odds for years. Family members, aides and politicians who have contacted Hariri in Riyadh say he is apprehensive and reluctant to say anything beyond “I am fine.” Asked if he is coming back, they say his normal answer is “Inshallah” (God willing).